HSE Regulatory Alert’s annual portfolios of back issues provide a valuable searchable archive of all the important changes in environmental, EHS and OH&S regulations, standards and guidelines in any given year. Each annual archive contains over 1,000 live links to the new laws, regulations, standards, codes, and guidelines you need to successfully manage your HSE responsibilities. As a free service to Canadian HSE professionals and those charged with health, safety and environmental compliance responsibilities, you can sample a typical archive at no charge by clicking on one of the icons below. Forms, lists, news items and reference material provided in the above archives are provided for the purpose of explanation and research only and should not be solely relied on as the most recent material available. To make sure your database is current and fully up-to-date, it is recommended that you subscribe to HSE Regulatory Alert today. Along with your current issue of HSERA, we’ll rush you a searchable archive of all back issues for the current year to ensure that you and your colleagues continue to have access to the most up-to- date information. 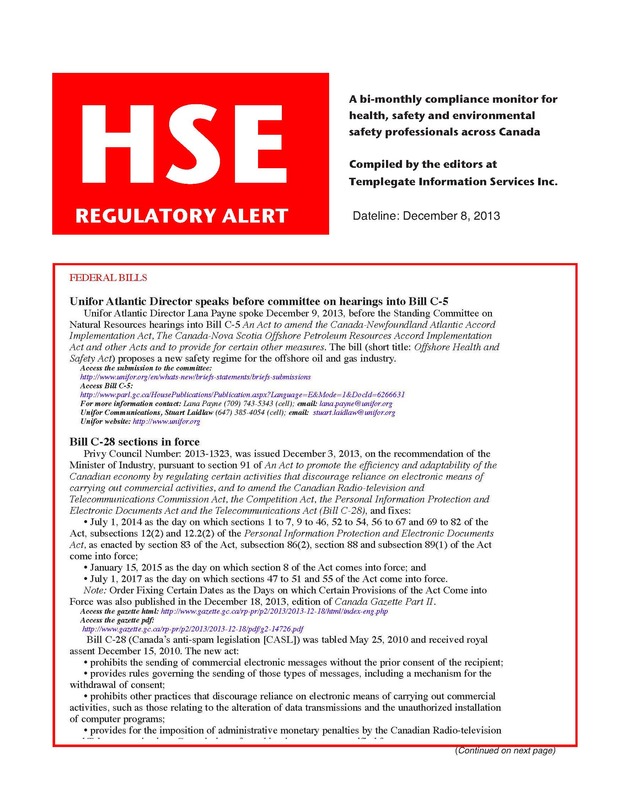 Each of the above files contains a year’s content (12 issues) of HSE Regulatory Alert in an Adobe Acrobat portfolio. You will need to download a recent version of Adobe Acrobat Reader to read the file. To access the archive of back issues, click on the icon to access the portfolio you want to search. Wait approximately 30 seconds for the archive to load. Enter key words into the ʻsearchʼ function in top right-hand corner of your portfolio to isolate the information you need. Under the ‘search’ box you will see a list of references. The issue containing the most occurrences of key word terms will appear at the top of the list. Click on individual issues and lines to find the reference that is most appropriate to your needs. Once you have located and read the various references in a given issue, click on the ʻx’ appearing in the top left-hand corner of the page beside the issue’s title to quit that issue and return to viewing the full portfolio. HSE Regulatory Alert is © 1999-2017 Templegate Information Services Inc. All rights reserved. The above portfolios and their content are protected by Canadian copyright law and are sold on the understanding that their content may not contain the most recent available information and should not be relied on to render legal, accounting or other advice. To establish the currency of any item, users are encouraged to consult their own professional advisers. Please make sure I receive updates on all of Templegate’s regulatory compliance publications and services. Copyright © 2017 Templegate Information Services Inc.. All Rights Reserved. Website design by Uncanny Owl Inc.